WE ONLY SHIP BARE ROOT DORMANT PLANTS THAT HAVE BEEN DUG NO LONGER THAN 2 DAYS PRIOR TO SHIPPING. THEY ARE NOT PRETTY WITH NO LEAVES ON THEM BUT THEY ARE NOT DEAD, WE DIG AND SHIP OUR PLANTS IMMEDIATELY. SEE IMAGE BELOW. IF YOUR PLANTS DOES NOT GREEN OUT THE FOLLOWING SPRING, WE HAVE A 1 YEAR WARRANTY ON ALL RETAIL QUANTITIES ORDERED. The Root System on Plants Received May Look Dry When Received But The Inner Root System Is Moist and The Gel Dries On The Outside Of The Roots and Make Them Look Very Dry But They Are Not, It's Sealing In Moisture and Putting A Plastic Like Coating On The Outside Of The Root system. Please Plant Your Plants and Water and They Will Do Exceptionally Well. Soil Moist polymers reduce your plant watering's by 50 percent, reduce transplant shock and soil compaction and is effective in the soil for 3 to 5 years. It is an effective water management aid that is ideal for interior and exterior plantings such as for trees, shrubs, containers, baskets, flower beds, vegetables and turf. Soil Moist acts as a form of insurance for the plant and is environmentally friendly. All plants are shipped dormant and immediately after they have been dug. Your plants may look dead but they are not, they are dormant without tops on most. They may have dead leaves from winter and they will not be pretty or have any blooms on them, this is how dormant plants look. Please look at the bottom of this page. There are images of what your plants will look like when received verses in springtime. Plant them, water well for the first 5 days and see. This is why we offer a 1-year warranty, to let you see they will bloom and be pretty and as advertised in spring. IF YOU HAVE SHORTAGES OR ANYTHING MISSING, PLEASE ALERT US WITHIN 24 HOURS OF RECEIVED DATE. We may require images for plants that are wrong size and/or broken. Shipping- Shipping in checkout is estimated only and is charged upfront. However, an exact shipping rate is unknown until plants are packaged and weighed and we create a label. If there is an overage in shipping, we bill your card in a desperate transaction when shipped. When plants are received, we only offer in-store credits on returned stock. Please make sure you put your name and order # are on return so we can properly give you an in store credit. With an in-store credit, you can order what you want instead of us replacing what you purchased in case you'd prefer another item instead. We Can Not Accommodate Requests For Plants To Be Shipped or Received On Specific Dates. Each plant has ship options beside it you must choose. We can not guarantee a ship date on any order, only a ship season. We seldom must but do reserve the right to substitute a plant for one of equal or greater value. If you do not want substitutions, please put us a note in checkout “no subs” and we will honor this. We only do in-store credits for future orders or re-orders of the plants you lost. 100+ plants per variety ordered are priced wholesale and we offer an "arrive alive"24-hour warranty on wholesale quantities. No further warranties on wholesale quantities after 24 hours. We will not accept returns after 24 hours of receipt. Plants must be returned within the 24 hour period after received. If they are not dead, we will not accept them back. You need to do a scratch test prior to returning them. how to perform a scratch test is listed below. Absolutely no warranties on wholesale orders placed if you are not a licensed nursery, no exceptions due to wholesale pricing being a very small profit ratio we cannot offer anyone not in the industry even a 24-hour warranty if they buy wholesale and not experienced and licensed dealing with bare root plants. We ship bare root plants. They need to be planted within a few days after digging. We dig them fresh and ship out within 1-2 days. We will not accept plants back if refused. No refunds, no returns and all sales final on plants after they ship and are refused. 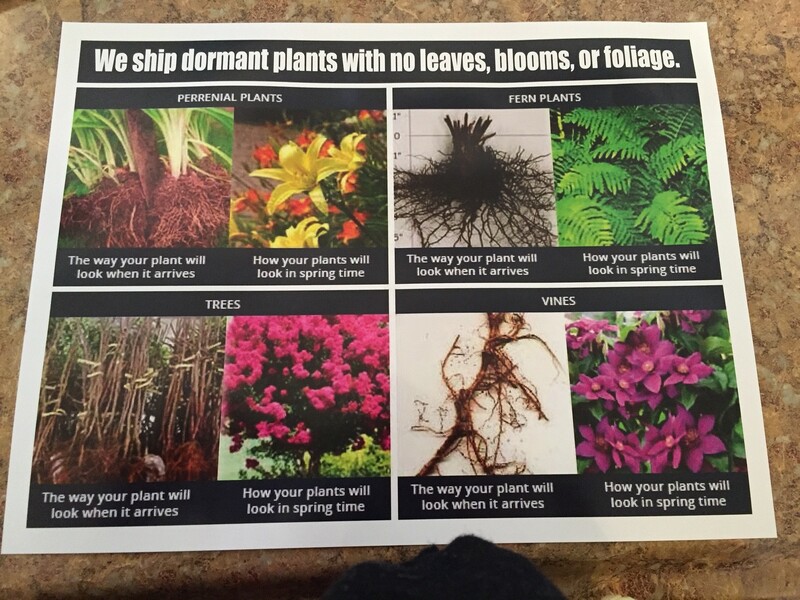 When our shipments are refused the plants die. If you do not want them, accept the package and return within 24 hours (FedEx or ups) to this address - 856 Main St, Altamont Tn 37301. When refused our plants go to a mail center 30 miles away from our location and are dead by the time we receive them back. We package all plants in boxes and breakage seldom happens. We are not responsible for carrier damage BUT WE DO OFFER INSURANCE OR Customer must file claim with USPS, Please Call 1-800-275-8777. If you have not purchased insurance you need to handle all claims. Insurance is available and customer must give us a call prior to shipping and pay for shipping insurance separate. Our plants are counted 4 different times before they ship and unless we find evidence one of your packages got damaged, we seldom honor shortage claims but if you see there is a shortage, we must be notified within 24 hours of received in order to research and check it. You will need to call 888-958-5640 and dial extension #5 and leave your name, order # and what's been shorted in your order. Failure to so within the 24 hour period after received will result in us not being able to honor your request. We will check your tracking # and make sure it's not over 24 hours when you call in also. Once you place your order online, the order is sent directly to the fulfillment department within a couple hours during business hours. If your order has not been sent to fulfillment, we can cancel it . If it's already sent it can not be cancelled. Also, we charge a 20% restocking fee for any cancelled orders. We get charged a percentage for credit card orders and this is to charge for our time in cancelling and our fee's we've paid for accepting your credit card orders. Please do not put the desired ship date in comments of your order or call and request specific dates to ship or receive. We get over 30,000 orders a year and this is impossible to do. We, however, do give you the customer options as to when to ship (mid or late April, spring & fall, depending on the season we are currently in). We will not be able to pay attention to any other shipping requests than the option you select when ordering. Still, don't believe plants are alive? Do a scratch test and this will prove they are alive. 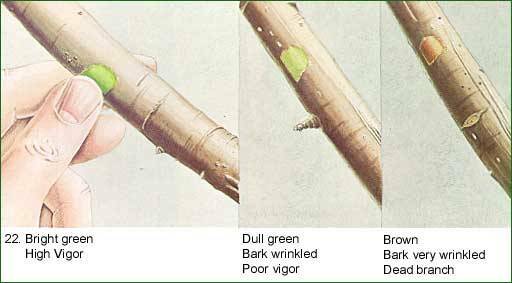 Simply scratch the bark and if the inside of the bark is brown, it is dead. If it is greenish-white, your plants are alive. If we have made any type error that is our fault we will gladly refund your money. For instance, sometimes we get so many orders a day we miss printing one. If you've ordered and it's not arrived and it's too late to plant or anything that is our fault, you absolutely you will get a refund. In store credits are for those with plants already received. Customer can not use multiple discounts. If a discount is offered store wide a coupon code will not be accepted, order will be cancelled automatically. Multiple coupon codes are not accepted and/or for free shipping plus a discount. Still don't believe plants are alive? Do a scratch test and this will prove they are alive. Simply scratch the bark and if the inside of the bark is brown, it is dead. If it is greenish-white, your plants are alive. BELOW IS EXACTLY WHAT YOU WILL RECIEVE. DORMANT PLANT ARE NOT PRETTY BUT THEY ARE ALIVE!